This is a gorgeous condominium in a gorgeous community. Bella Sirena has 5 pools, an aqua bar, mini golf course, tennis court, beautiful gardens, beach homes, villas and condominiums. We have a reserved underground parking space just for your condominium. This resort has the most beautiful views of the ocean from your condominium. Easy access to the beach, it also is a prefect scenery for weddings. Welcome to beauty. This unit is, as mentioned before, GORGEOUS!! It is an understatement, you have an amazing looking living room sofa set, the very comfortable sofas are wood and fabric laced. The color is a light caramel and they have different earth tone cushions that work perfectly with the seats. The coffee table has glass top and it is fantastic. The dining room has a lovely dining set, it seats 6 people around its rectangle wood table. The huge kitchen is fully equipped, ready to prepare a feast. The cabinets are light honey colored and bring out the nice color of the counter tops. Down the hall, you will find the laundry room and the guest bedroom. This bedroom has a queen size bed, beautiful thick wood. The whole bedroom set is the same wood and color; even the full size mirror on top of the cupboard. Everywhere in this bedroom, everywhere you look there´s perfection. It is so lovely, from the comforter to the bed, side tables and cupboard, bed and blinds. 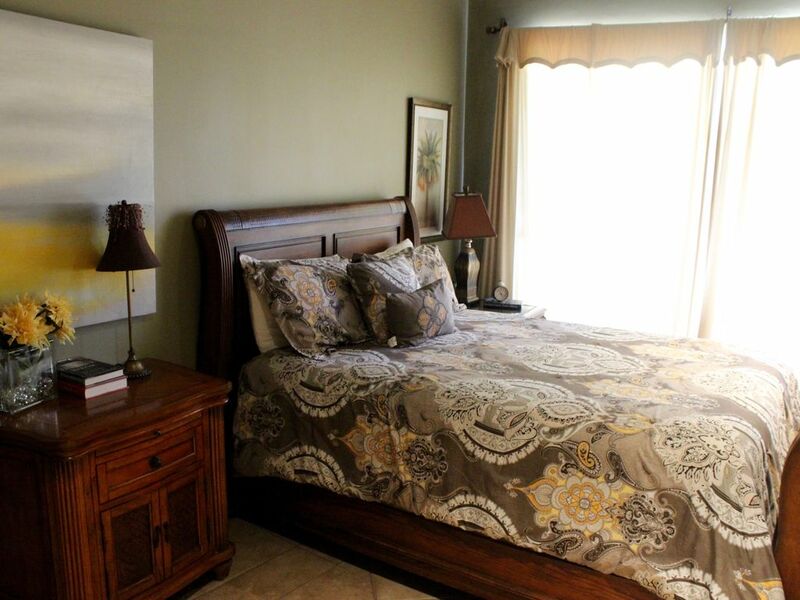 The master bedroom is in the same style, it has an amazing view of the resort and the ocean. Both bathrooms are very spacious and elegant. The view is breathtaking. You could stay for hours looking out towards the ocean. It is the perfect place to be to say hello to the day watching the sunrise or watching the sunset. You will enjoy this resort greatly. OUR HOME IS YOUR HOME WHILE STAYING AT THE BEAUTIFUL BELLA SIRENA RESORT! THERE IS NO BETTER WAY TO ENJOY ALL OF THE BEAUTY OF PUERTO PENASCO, MEXICO! Beautiful and clean. Great location. Safe and nice people. Only problem is the internet did not work. The user ID to sign in and password were not readily available. Also the managing agency took a $200 cleaning deposit and said they would give back $200. They kept 3% for processing my credit card. I know only $6 but it's the principle. I would stay there again but would suggest fixing these things. Excellent property. All necessary information and amenities provided. Beautiful resort. Will definitely rent this particular unit again. My experience was amazing, from the time I checked-in until the time I checked-out. I was pleasantly surprised when I first walked into the condo with the appearance/furnishings that were in the condo. The balcony is HUGE with a great view overlooking the property and ocean. I will definitely be staying here again in the future!